Directed by Jonas & François. Directed by Davin Black for 235films. Produced in co-operation with MuchFACT, A foundation to assist Canada Talent. TWO of the hottest stars in hip-hop, B.o.B and Big Boi, have teamed up to produce a brand new track, “Double or Nothing,” the official theme song for Army of TWO™ The Devil’s Cartel. The demo for the game is available now for Xbox 360 and PlayStation 3, complete with epic explosions, massive destruction, and plenty of dynamic co-operative action for you to enjoy with a friend! Visit http://www.armyoftwo.com/demo for more information. When Kat Dahlia’s single, “Gangsta,” hit the internet, the web went crazy — Kat’s a natural born storyteller, and people connect to her music and her razor-sharp lyrics about her hard-knock life. XXL commented, “She spits her life…with no hesitation of going personal” while MTV.com called her the “hip hop Lana Delray.” Others have compared her to a diverse range of artists, from Santigold to Adele, but there’s one sentiment everyone seems to share: Kat Dahlia’s music is fierce, personal and raw. With the release of “Gangsta,” her first single with her first video premiering on VEVO on today, Kat’s proven herself well-beyond worthy of the buzz that started when she signed with Sylvia Rhone’s Vested In Culture/Epic label last year. Rhone – who easily qualifies as a legend, delivered a formidable endorsement by signing Kat to her label. Kat recorded her album over the past six months, and she’s about to officially turn it up. Today, three bundled tracks (Gangsta, Money Party and Mirror) from her upcoming debut will be available on iTunes http://smarturl.it/gangsta3track , Amazon MP3 and all digital providers. On March 15, Kat will head to SXSW, where she’ll be performing at several shows to be announced soon. SXSW marks her first public live shows and she’s going big! On top of all of that, she has been chosen as a BET Music Matters artist. Saving money from a waitressing gig, Kat moved to New York in 2010. She was almost derailed by what she describes as a “toxic relationship,” but she got herself out of it, and emerged fired up as a writer, with new insight and a deepened commitment to uncompromising emotional honesty. Coming up with the funds to finance studio time, Kat released a music video and an EP, and signed with Vested In Culture (VIC) shortly thereafter. When the pair collaborated on both Aesop’s Skelethon (Rhymesayers) and Kimya’s Thunder Thighs (Great Crap Factory), the two decided that they wanted to continue making music with each other as a group. The band name, which means to keep the things you don’t appreciate out of your life, is based on an excerpt from Michael Bernard Loggins’ book Imaginationally. This record helps to tell the story of two people who are finding therapy through making art together. 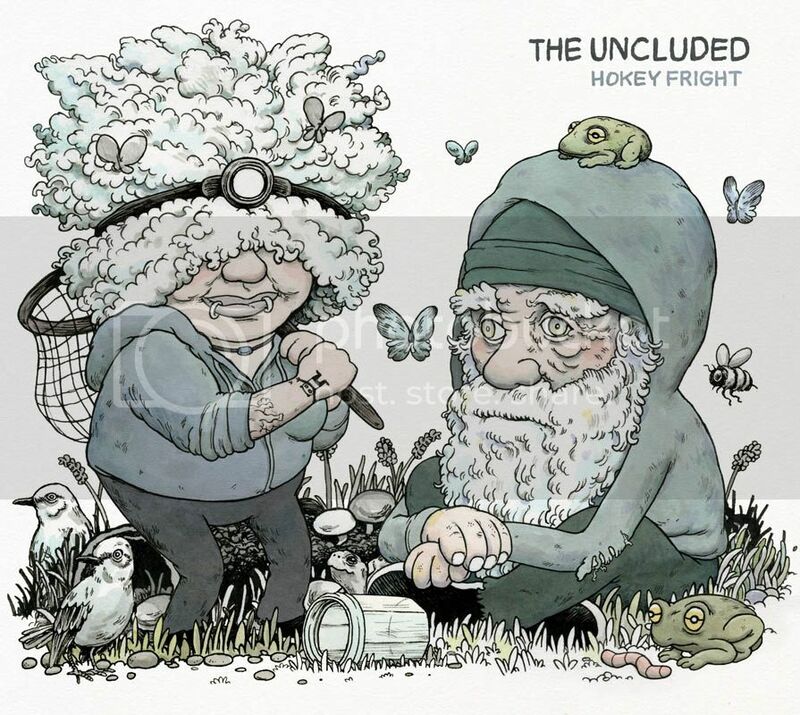 Hokey Fright’s 16 tracks were written, performed and recorded entirely by Aesop and Kimya, except for a guest drum appearance by James McNew of Yo La Tengo on “Delicate Cycle”. The album artwork was also done by illustrator/artist Travis Millard. While the record retains Aesop’s signature dense wordplay and Kimya’s soft spoken and innocent lyrics, the album has a dark feel, as the record was recorded in the wake of recent personal losses. While it may seem like an unusual pair, each artists’ best qualities shine through making an enjoyable listen for fans of both. Chicago hip-hop influenced production duo, Flosstradamus, are gearing up to take Austin by storm in two weeks with their official TURN UP! SXSW showcase. Set for Friday, March 15th from 9 PM – 2 AM at Republic Live (301 W. 5th Street), the showcase will feature performances from Supreme Cuts, Toddla T, Cashmere Cat, Mykki Blanco, DJ Slink, Chief Keef and organizers Flosstradamus. To get you in the mood, check out the new video for “Look at the Sky” feat. Deniro Ferrar which puts the duo’s meticulous production centerstage and features samples from Opus III’s iconic spacey 90s house jam “It’s a Fine Day”. “A confluence of…everything. Airy synths drift over a heavy drum loop that slowly compresses itself into tunnels of sound, and there’s a ghostly, Aphex Twin-esque vocal sample that fuzzes and glitches beyond the point of intelligibility. It feels like a survey of noise and harsh electronics against a welcoming backdrop. But beyond all that, it’s a gorgeous track that effortlessly synthesizes so many disparate sounds into one cohesive piece”. Locust just announced their full-length release on European electronic label Editions Mego this April 16th, entitled You’ll Be Safe Forever. The two Locust band mates Mark Van Hoen and Louis Sherman have accomplished the melding of 50 years of electronic musical history in a beautifully crafted album, with sounds evoking memories of early electronic icons like Delia Derbyshire, through to Tangerine Dream, Eno, Throbbing Gristle, LFO and beyond. The record combines ’80s industrial techno, the spoken word of underground disco, cosmic synth lines, and ambient distorted dream vocals combined with rhythmic looping drums. The overall effect of You’ll Be Safe Forever seems to promise the contrary — not unlike a haunting dream that wakes you up to a different reality, shrouded in an almost spectral haze. The tracks are instrumental but there are voices everywhere, cut up and tweaked or stretched out, leaving echoes of silence. The overall result, Van Hoen says of the album, is that “the music is more emotional than academic”. Locust’s new release You’ll Be Safe Forever makes you question what you’re hearing and feeling all at once. The result is something unquestioningly, mind-bendingly beautiful. Locust will be playing at the Editions Mego special event at the De La Warr Pavilion in the UK this May 11, alongside Luc Ferrari, Kevin Drumm, Mark Fell, Fennesz and more (full details here). Since the release of his debut solo album “Dope Sick”, Madchild from Swollen Members has refused to rest. He embarked on a sold-out Canadian tour alongside Tech N9ne, and went right back out on the road on his 40-date headlining tour across the country. This summer Madchild will join the traveling punk-rock circus known as the Vans Warped Tour alongside Mac Lethal, MC Lars, Goldfinger, Forever the Sickest Kids, Big Chocolate, The Black Dahlia Murder, and others. Madchild is also gearing up for the release of a new Swollen Members album entitled “Beautiful Death Machine” on March 19th via Suburban Noize/Battle Axe Records.Armed with their signature brand of dark, sinister, spellbinding hip-hop, Swollen Members new album sounds aggressive, confident and commands listeners attention with its in-your-face attitude.